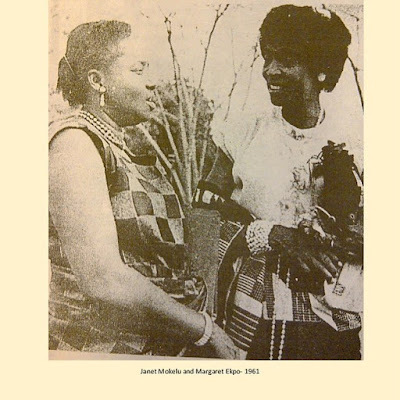 Margaret Ekpo and Janet Mokelu . Two of the three(Olufunmilayo Ransome Kuti) women who were appointed officials when Nigeria established its state . Colonialism drastically limited women's ability to gain an education and enter into leadership positions . The British brought their patriarchal sexist culture and prevented women from actively participating in Nigeria . However , as my previous posts showed . Nigerian women understood their oppression and intelligently articulated their conditions and found innovative /creative ways to resist and build community . We stand on the shoulders of giants . While they may not have had the term feminism , Nigerian women and women of African descent have been demonstrating autonomy and working to eradicate all forms of oppression since forever forever.